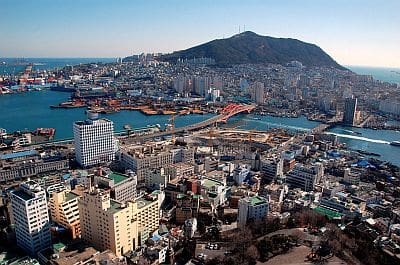 In Busan (or Pusan), Korea's second largest city, located on the southeast coast, the climate is temperate: winters are quite cold but sunny, and summers are hot, muggy and rainy, but tempered by the breeze. Like the rest of Korea, the city is affected by the monsoon circulation: in winter, cold northwest currents prevail, while in summer they will be replaced by hot and humid currents of tropical origin. Spring and autumn are transitional periods, mild and pleasant, especially the month of October. In winter, the average temperature is a few degrees above freezing (0 °C or 32 °F); there are quite mild periods, with highs around or even above 10 °C (50 °F), but also cold periods, sometimes freezing. In the worst moments, the temperature can drop to -10 °C (14 °F) or even below, though it goes better than in Seoul, where the temperature can plunge to -20 °C (-4 °F). Busan is located in the least snowy area of Korea, that of the south-east coast: here snowfalls are very rare, and generally light. Spring is mild, but the rains gradually increase. However, owing to the monsoon the rainiest season is summer: from June to August, more than 700 millimeters (27.5 inches) of rain fall. The rains can sometimes be torrential. The worst month, the wettest and least sunny, is generally July. In summer, there can be also periods of good weather, which can be very hot, with highs about 35 °C (95 °F). In autumn, rainfall decreases, and by October the rains begin to be quite rare. Here is the average precipitation. From July to early October (and occasionally also in the second half of June), Busan can be affected by typhoons, the tropical cyclones of South-East Asia, which affect in a special way the southern coastal area, bringing torrential rain and strong winds, as happened with super-typhoon Sarah in September 1959, with typhoon Maemi in September 2003, and more recently with typhoon Sanba on the 17th of September 2012 and with typhoon Chaba on the 4-5th of October 2016. The amount of sunshine in Busan is good in winter, when there are many sunny days, while owing of the summer monsoon it reaches its minimum in July, when cloudy skies prevail (the sunshine percentage drops to 37%). In Busan, and along the southern Korean coast, the sea becomes warm enough for swimming in August and September, but basically it is acceptable also in July.